Kuala Lumpur is located near the epicentres of ancient fault line zones. – The Malaysian Insider file pic, June 11, 2015. Following the quake tragedy in Sabah, there have been concerns that an earthquake may also hit Kuala Lumpur and according to a geological expert, such misgivings are not misplaced. 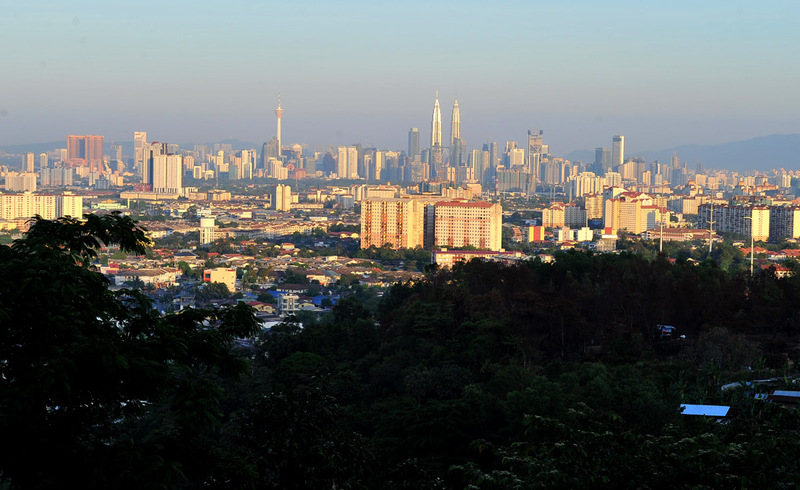 This is because the federal capital is located near the epicentres of ancient fault line zones, Universiti Malaya Geology Department Associate Professor Mustaffa Kamal Shuib told The Malaysian Insider. These fault lines seem to have been reactivated by active tectonic plate boundaries and this, he said, was a cause for concern, especially since many structures in the city were not built and designed to withstand earthquakes. “The general perception has always been that Peninsular Malaysia was safe because we are far from the Pacific Ring of Fire which surrounds us, but in recent years, there is evidence of earthquakes with focal points or epicentres right under our feet, due to the reactivation of old fault lines,” said Mustaffa. Asked what causes the reactivation of fault lines, Mustaffa said Malaysia is surrounded by so many active tectonic plate boundaries and the Sunda Shelf, which the country sits on, is being compressed. Peninsular Malaysia is at the centre of the shelf, also known as Sundaland, which is absorbing all the stress from around it. “Sooner or later, the earth has to find some release by breaking through old fault line systems,” said Mustaffa whose field of research is structural geology and tectonics. “This causes earthquakes,” he said. Mustaffa said he and his team first detected epicentres in 2007 and 2009 in Bukit Tinggi, near Genting Highlands, in Pahang, but some of these occurred to the west, near the KL fault zone. The quakes were not strong but it is hard to say if they will increase in magnitude in the future, he said. “The strongest one we have detected so far is a magnitude 3.5 in Bukit Tinggi. “When we have epicentres (like Ranau, Sabah which was recently hit by a magnitude 6.0 quake) there is a possibility of earthquakes hitting the fault line zone,” he said. Mustaffa said in the past, Peninsular Malaysia had suffered tremors from distant sources and places like Sumatra and the Philippines, but now there was evidence of seismic activity in fault lines detected in the Peninsular itself. There are 4 fault zones in Peninsular Malaysia – Bukit Tinggi, Kuala Lumpur, Lepar (north of Pahang) and Seremban (Negri Sembilan). 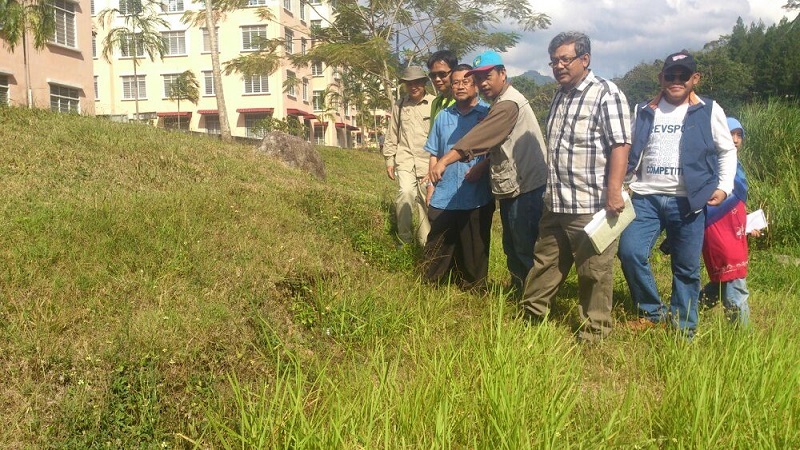 Universiti Malaya Geology Department Associate Professor Mustaffa Kamal Shuib (in checked shirt) with the team from the Malaysian Meteorological Department mapping out fault lines. – Pic supplied, June 11, 2015. All have epicentres along them, Mustaffa said. A 3.5 magnitude earthquake may not cause destruction but could damage buildings and structures, said Mustaffa. “However if there is a higher magnitude earthquake, most of our buildings are unfortunately not designed for it,” he said. On Tuesday, Kuala Lumpur mayor Tan Sri Ahmad Phesal Talib had said that DBKL would review the construction of new highrise buildings in Kuala Lumpur, especially the safety aspects of these buildings to withstand earthquake tremors. He had said the views and advice of relevant experts would be sought with regard to this. Phesal was asked to comment on a local media report which touched on Malaysia’s location that put the country at risk of earthquake tremors in future. Asked about early detection and warning system that can be put in place, Mustaffa said that he was currently working together with experts from the Meteorological Department to study and map out seismic activity along old fault lines in Sabah, Sarawak and Peninsular Malaysia. This report will be submitted to the Science, Technology and Innovation Ministry which is funding the effort, he said. “We started this study about two-and-a-half years ago and will be finalising our findings any time now,” said Mustaffa who has been attached to Universiti Malaya’s Geological Department for 30 years. Meanwhile, Singapore Earth Observatory Professor Kerry Sieh was reported as saying that the Earth goes through cycles of seismic energy release, and less release and more release. “We have definitely been in the active cycle in the last 11 years since 2004. All the magnitude 8.4 earthquakes and bigger, up to 9.2, they all happened in the last 11 years. Several of those have been in Asia,” he told Bernama. The previous active cycle was in the 1950s to mid-1960s, which saw several earthquakes with a magnitude of a high 8 and above 9. But for the next 40 years, there were no records of a quake with a magnitude above 8.3, until 2004. “We don’t know whether we are at the end of the cycle or not,” said Sieh. “My hunch is we will continue to see a larger number of large earthquakes. But that’s only a hunch because we don’t really have a way of telling whether we are at the end of the cycle or not.” – June 11, 2015.